Update: This washer turned out to be a big disappointment with a total breakdown after just seven years of use. To double the frustration, the companion dryer also went around the same time. The rating was adjusted. At first glance, this Whirlpool Duet Sport HE Washer Model WFW8500S looks complicated to use, but programming is extremely easy and the triple dispenser is a convenient feature. Although this front load washer is higher priced than a top loader, the savings in water and energy consumption will quickly cover the difference. Front load washing is different than with a top loader - read the manual thoroughly. 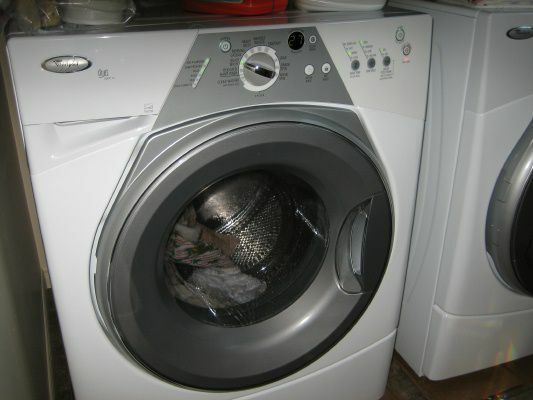 This is a great washer that performs well and is a pleasure to use. Energy Star qualified; uses 60% less water and 72% less energy than traditional washers. See Profile for additional details and information. Add-a-garment feature and Clean Washer setting. Installation instructions are thorough and no problems were detected getting this washer up and running. Only high efficiency (he) detergent should be used with this front load washer and follow recommended levels. The placement of the dispenser system is wonderful and levels are well marked. Wash cycles are preset but can easily be customized with some options being available with certain cycles. The spin action is terrific - much more water is removed from clothes than a top load washer - shortening drying time required. Water levels adjust automatically to the size of the load - no guesswork and this conserves water. Washing action is a gentle swishing back and forth motion and clothes do come out clean. Some cycles have very long estimated wash times to ensure a good clean washing, but there is also a quick wash at 28 minutes. The Add-a-Garment light is on for the first 7 minutes - and it worked well to add an item by pausing the cycle. The status lights and timer indicate how long before a cycle is finished. You can pause/cancel anytime to change cycles. Once the cycle is done, rotate the drum slightly to check that all clothing is removed as some can cling to the top of the drum, and the door should be left slightly ajar for the inside of the drum to dry. Check the door and drum seal for bits of clothing or debris, and use mesh garment bags to wash small items. Load capacity is just slightly less than a full-size washer - I was amazed at the load sizes. This Whirlpool Duet washer continues to work well and I enjoy using it. I have not had any of the mold problems often associated with front-load washers, by following these tips for caring for a front-load he washer. The only problem is the main control knob which has broken and needed replacing. I have found, though, that longer cycle times (rather than shorter) were needed when the load was very dirty, in order to get it cleaned. I have washed a Queen comforter in it and you can get it stuffed in the washer, but I think this size of bedding should be cleaned in a larger washer.